Thanks to the great help of @rorywalsh and @iainmccurdy, I wish to share the following set of Cabbage 2 instruments (I did not test them with cabbage 1). Most of the code is based on Iain's and Rory's examples. It's a 32 steps for 12 instruments, each step velocity can be adjusted thanks to its slider. By default, each instrument complies with GM midi drum note (i.e. Note 36 = Kick).. Therefore it can be used with other sample players. As turned into a vst , it can be triggered by the host. The player is made of 12 instruments receiving midi messages from the sequencer. Each instrument sound can be modulated thanks to a pitch change, filter (low or high ), pan and reverb. A very raw envelope is also included in order to avoid click and interrupted reverb. (If reverb is stopped in the middle, increase the release time). In order to load sample, prepare a directory with 12 samples (I number them to make sure that the 1st sample is loaded into the first instrument, i.e. 01-Kick.wav, 02-SdStick.wav, ....) and click on the button "open samples". It might take a few second until the filers are updated. [EDIT ] It accepts both mono and stereo samples. 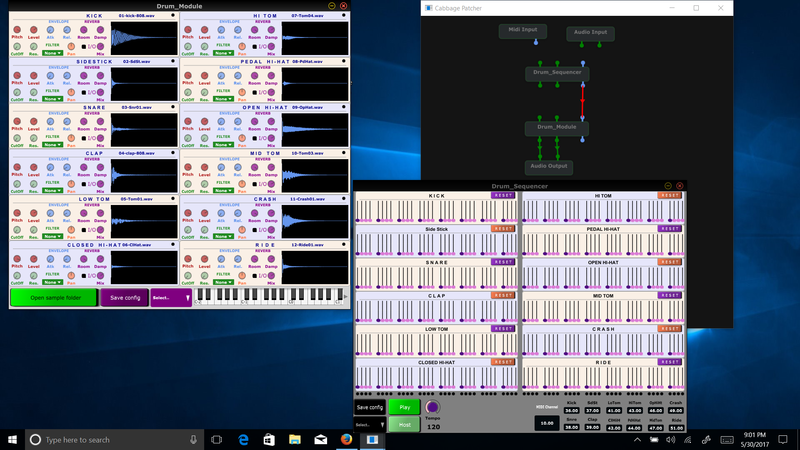 To play with the set in cabbage : open the cabbage patcher and connect the midi output of the sequencer to the midi input of the sample player. Feed back is welcome, bug reports also. As I am a noob in csound and Cabbage, please don't expect to much from these. Should they work on your computer, I wish you a lot of fun. Please share you sound tracks ! Should you enjoy it, please thank @rorywalsh and @iainmccurdy ! I had a chance to play around with these earlier today. Lots of fun, and they work very well in the new patcher. A random function for generating patterns would be a nice addition. It should be easy enough. A few lines of code at most.